I should clarify that the quote in the title is not from Greg Warren. Those of us oldsters know it was Rodney Dangerfield who used to say it. I can’t imagine those words coming from Greg Warren’s lips. But his position is certainly one which gets little to no respect. QUESTION: Just how difficult is the position of long-snapper? Seems like it should be a spot where a guy can snap and play another position as well. ANSWER: Long-snapping is easy, until the game-winning field goal attempt sails wide because the snap was either slow or off-line. Long-snapping, which typically refers to punts, and short-snapping, which refers to placement kicks, are timed to one-hundredths of a second, and one tenth-of-a-second can be the difference between making an NFL roster and being out of football. Also, NFL snappers are expected to put the ball on the spot designated by the holder every time. EVERY TIME. Rain, cold, windy. EVERY TIME. And the best ones also shoot the ball back there right on the spot but also with the proper spin so that when the holder puts the ball on the ground the laces already are facing the way the kicker wants them. Did I mention that all of this is expected EVERY TIME? Saving a roster spot is a nice idea, but in those situations when a game is going to be decided by a kick, I want Greg Warren standing over the football, not a backup guard, or a No. 3 tight end, or whatever position that extra guy on the roster is actually playing. Greg Warren is now one of the few remaining players from the 2005 Super Bowl team. It’s a pretty exclusive club, containing Ben Roethlisberger, James Harrison, and Warren. He was signed by the Steelers that year as an undrafted free agent, and other than two significant injuries in 2008 and 2009 which kept him out a total of nine games (both knee injuries) he has started every game for the Steelers. 25 March 2008: Steelers signed LS Greg Warren to a three-year, $2.3 million contract. Included is a $395,000 signing bonus. “LS” stands for long snapper. The Steelers are fine with Warren there, but he doesn’t play an actual position. 21 December 2009: Steelers placed LS Greg Warren on injured reserve with a torn right ACL, ending his season. This is the second straight season that Warren has landed on I.R. with a torn ACL. Last year, he tore the anterior cruciate ligament in his left knee. The Steelers will be on the lookout for a new long snapper. 2 August 2011: Steelers re-signed LS Greg Warren to a two-year contract. Warren has been the Steelers’ long snapper since 2005. Despite multiple ACL tears, he’s back for more. 13 March 2013: Steelers re-signed LS Greg Warren to a one-year contract. Warren, 31, has been Pittsburgh’s long snapper for the last eight seasons. 14 August 2014: Steelers LS Greg Warren is out four weeks with a meniscus tear. 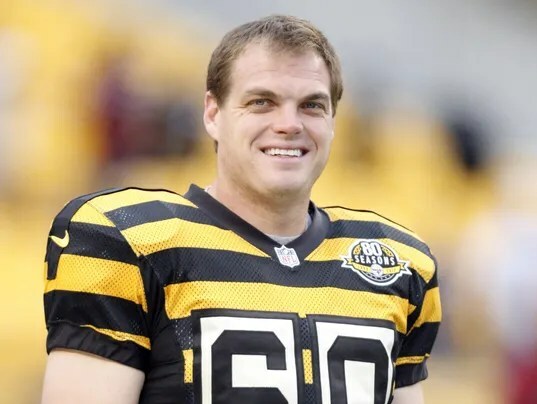 4 February 2015: Steelers re-signed LS Greg Warren to a one-year contract. Warren, 33, has been Pittsburgh’s long snapper for the last 10 seasons. “He doesn’t play an actual position.” That one had to hurt. “The Steelers will be on the lookout for a new long snapper.” Probably didn’t enjoy that one either. A slew of one-year contracts—doesn’t seem very respectful. So his Weighted AV is 8. It seems to me that a position in which you touch the ball so many times and can potentially effect the outcome of the game frequently when you do so ought to be worth more than that. Maybe long-snapper is something “almost anyone could do”. This carries the obvious implication that the guy isn’t really an athlete. I can’t speak for any long-snappers except Warren, but he is a true athlete. In addition, he actually managed to extract an education from his college career—he double-majored in biology and exercise & sports science at the University of North Carolina, graduating in 2004. Warren still holds the squat (500 lbs. ), power clean (364 lbs. ), and bench press (360 lbs.) records for specialists. He served as team captain in his senior year and won the Athletic Director’s Scholar-Athlete Award. Going back to high school, he not only lettered in football for four years but also in track and field for three. He was also a member of the National Honor Society. The Steelers signed him for yet another year last month—the only multi-year contracts he has gotten were during his first six years. He’s one of the Steelers you don’t think about too often, until James Harrison snaps the ball. I was able to get into grad school. It was an offer I couldn’t refuse. I came back and had a successful year, but it didn’t seem like I had many looks from any scouts. I had a couple of phone calls from some teams, but I wasn’t expecting much. Immediately after the draft the Steelers called and said they wanted me to compete with their guy for the job. Even then, I didn’t know how much chance I had. I decided to take the opportunity and just do my best. I had a good summer and had a good training camp and they decided that they were going to make the move and change long snappers. The rest has been an awesome ride. I’ve been a part of three Super Bowls now and hopefully can continue into my seventh season next year, which is something I never would have dreamed of. I’d probably be a high school biology teacher. I feel blessed. I pray every day thanking the Lord that he’s done this for me. My life has totally been changed for the better. I’ve been able to do a lot of charity work, which I love, to give back, help kids and help those in need. I’ve really been able to use this as a platform to give back in a lot of ways. I did some charity work at UNC by going over to the Children’s Hospital on Fridays before home games. Now, I help out with a golf tournament in Durham called “Sport For Special Kids.” They contribute to kids with disabilities and birth effects and helping them in their daily lives. I also give to the Garth Brook’s charity called “Teammates For Kids.” The great thing about that charity is that everything contributors give, they triple, 100 percent of the money goes to kids and Garth Brooks pays all the overhead. I give back to my hometown. My peewee football coach, Alex Ferrell, has built a football field in the center of town out of absolutely nothing. He put lights on it, bleachers, turf, a scoreboard. We put a field right in the middle of town where we can provide a place to get kids off the street and have something to do. He’s done all the work, I’ve just helped him springboard the monetary aspect of it. Warren is also involved with fundraisers for Big Brothers/Big Sisters, and for the Cystic Fibrosis Foundation, as well as helping to support many of his friends and teammates’ events such as “Shear Da Beard”. He and his wife also supported the Pediatric Brain Tumor Foundation this past season, a charity very near to him and his wife’s heart, since she had a brain tumor removed in 2013. Warren was fortunate to come into the league at a time when the long-snapper was beginning to be established as a specialist. In fact, the first Pro Bowl team to have a dedicated long-snapper was in 2006. Timing is the major part of a long-snapper’s job, but timing also seems to have been a big part of his professional life as well. From the sounds of things Warren would have been a great biology teacher., but the Steelers have been fortunate to have him instead. Although now that I think about it, Warren tried to teach me (and about 20 other women) how to long snap in about 5 minutes at a Ladies Training Camp, and we were still pretty hopeless at the end of it, so maybe he wouldn’t have been such a great teacher after all. But perhaps it wasn’t a fair test. He might end up going back to teaching after his NFL career ends, as Cameron Heyward says he intends to do. Whatever he chooses to do, I suspect he will do it the way he has been a Steeler—quietly, methodically, reliably. In a high-visibility profession he has flown under the radar. And something tells me he’s just fine with that. Nice portrait of an invisible Steelers. I keep saying it, but this is why we love Going Deep. Positive stories about the famous or the obscure are always appreciated. Thanks for this story on one of the most unknown players.